Another month and another round-up of Malaga events. In this post we look at what’s on in Malaga in February. Like January, this is usually a quiet month for tourism and those lucky enough to visit get most of the attractions in Malaga almost to themselves. But just because it’s low tourist season doesn’t mean there isn’t much to do. February is a very colourful month with the celebration of Carnival. It’s also a romantic affair with Valentine’s Day and of course, there’s plenty of music, art, fun runs and some great markets. Read on to discover what’s on in Malaga in February. Note that this is a work in progress – it’s really difficult to get advance notice of events so we’re adding to this all the time. Bookmark the page for updates! Malaga celebrates the Day of Andalucia on Thursday 28 February when banks, businesses and shops will be closed. Bars and restaurants should be open as usual along with museums and monuments. The Museum of Malaga will be on its public holiday timetable (9am to 3pm). For a guide to public holidays in Malaga in 2019, read this. One of the highlights of the year and definitely one of the loudest and brightest. Malaga Carnival runs late this year and takes place from 23 February to 3 March. Expect a week of celebrations, music, dancing, parades and of course, lots of dressing up. 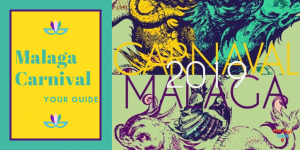 To find out what’s on at Malaga Carnival, check out our dedicated post. This is still going strong in February with some excellent performances (mostly in Spanish) at the Cervantes and Echegaray Theatres. You can see the full programme for the Malaga Theatre Festival here. The weekend 15 to 17 February is all about arts and crafts. The 3rd edition of Malaga Creativa takes places at the Congress Palace for 3 days of crafting inspired by Carnival. 65 brands and shops will be there and you get the chance to attend workshops, master classes (some free, some not) and get expert advice. Plenty of activities for kids too. Friday 15 and Saturday 16 February 10am to 8pm and Sunday 17 February 10am to 6pm. Tickets from €5 available on the door or via this link. Get there on the No 19 or 20 bus from the Alameda Principal – allow 30 minutes with a short walk at the end. Play Cras, Koechlin and Françaix at the Picasso Museum on Tuesday 19 February at 8pm. Get your tickets from the museum ticket office or online here. €10. Piazzola was the world’s greatest tango composer and how better to celebrate St Valentine’s with a concert of his most romantic tunes? Promúsica Chamber Orchestra plays them on Saturday 2 February at 8pm in the lovely Sala Maria Cristina at 8pm. Tickets €10 available here. Almost as romantic is the piano concert by Leonel Morales on the piano accompanied by the Impromptu Quintet playing 2 Beethoven sonatas plus Chopin. Thursday 7 February at 8pm in the Sala Maria Cristina. Tickets €10 available here. 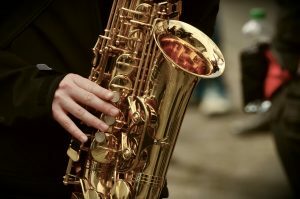 Jazz fans are in for a real treat at the end of the month when the MVA Jazz Festival has 4 jazz concerts featuring some pretty big names and all free. All concerts are at 9pm in the MVA on Calle Ollerías 34, to the west of the old quarter. Free entry but you need to get your ticket from here. Tickets available from 20 February at 10am. Save the date if you’re really keen because these will go quickly. Saturday 2 March – Wolfgang Muthspiel Quartet featuring Ricardo Toscano (on sax). One of the biggest musical events in Malaga is Aida. The opera comes to town at the Cervantes Theatre on Friday 1 March at 9pm and Sunday 3 March at 7pm. Tickets from €20 here. If you fancy getting off the beaten track on a Saturday morning and enjoying a free concert at the same time, make yourself to the Monasterio de las Mercedarias in Calle Cruz del Molinillo to the north of the city centre. Sponsored by the Jorge Rando Museum next door (well worth a visit too), the concerts take place every Saturday at noon in the monastery chapel. It’s a small venue to arrive early to be sure of a seat. The Mendelsohn Quartet plays in the central patio at the Museum of Malaga on Sunday 3 February at noon. Free entry. This museum hosts an exhibition by Lithuanian artist Zenonas Vernauskas, one of the most famous Baltic painters during the 20th century. His works cover 3 key periods – pre World War II, the USSR and the independence of Lithuania. From 4 February to 11 May. Open Monday to Saturday 10am to 8pm. Free entry. This art museum in Malaga is about to say goodbye to the Socialist Realism and welcome a brand-new collection. You have the last chance to see the current exhibitions at the open doors weekend on Saturday 2 and Sunday 3 February. Free entry from 9.30am to 8pm. The museum will be closed while the new exhibitions are installed. As usual, the three new collections offer the chance to see some exceptional work by artists who are virtually unknown outside Russia. They arrive during February and doors open on 26th. Saints, Queens & Workers – the main exhibition takes women as its central theme and celebrates art works of women by Russian artists. The works will travel through the entire history of Russian art from early icons of the Virgin Mary to contemporary portraits of women. On show until 27 February 2020. Women Artists – continuing the female theme, the main temporary exhibition showcases the most important Russian women artists from the 20th century to today. Until 8 September. 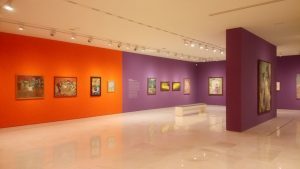 Gmurzynzka Collection – Gmurzynzka was the first western art collector to take a serious interest in early 20th century Russian art and this temporary exhibition shows some of the most important works in the collection. Until 8 September. Open Tuesday to Sunday 9.30am to 8pm. Permanent exhibition €6, temporary exhibitions €4, €8 combined ticket. Free 10-11 February all day and on Sundays after 5pm. Look out for a dedicated post on the new exhibitions at the Russian Museum in Malaga. The most visited museum in southern Spain (and one of the top museums in Malaga) welcomes a brand-new temporary exhibition in February. Olga Picasso looks at the life of Picasso’s first wife and his works during their marriage. Picasso met the Ukrainian ballet dancer in Paris in 1917 and they married a year later. The 350 objects on display include photos, letters, paintings, sketches and videos that reflect their relationship until 1935 when they separated. From 13 February to 13 May. Open daily 10am to 6pm (7pm from March). Temporary exhibition €5.50. The Thyssen Museum is still showing the lovely Fury of Colour exhibition. The collection of mostly by Iturrino includes some exquisite paintings of the Concepción Botanical Gardens. If you love colour in art, don’t miss this art exhibition in Malaga. Until 3 March. Open Tuesday to Sunday 10am to 8pm. €10 including permanent exhibition. Saltimbanquis Suite – Picasso’s early work is famous for its harlequins and circus figures. This exhibition shows his first serious engravings made between 1904 and 1906. Illustrated books – one of the artist’s least known talents, but Picasso excelled in this field too. The exhibition showcases 2 of his masterpieces: Ovid’s Metmorphosis and Balzac’s Le chef d’oeuvre inconnu. Open daily 9.30am to 8pm. Temporary exhibitions €3, combined ticket to visit the museum and temporary exhibitions, €4. Free entry Sunday from 4pm. CAC Malaga has 2 main exhibitions this month. Jose María Baez – the Cadiz artist exhibits his takes on literature and philosophy in art in his colourful installations in work. Words (in different languages) take centre stage on rather plain wood giving them more impact. Until 10 March. 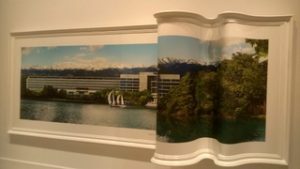 Dionisio González – in the largest section of the CAC, this contemporary artist from Gijón in northern Spain has almost 100 works on display including photos, videos, prisms and models showcasing architecture, design and photography. His photo-montages of modern architecture on what’s already in place are very interesting. Until 17 March. While you’re at CAC, don’t miss the permanent and Neighbours exhibitions. They’re both packed with interesting and thought-provoking art work and installations. Open Tuesday to Sunday 10am to 8pm. Free. The multi-coloured cube continues with Modern Utopias, an exhibition that takes you round European art with some of the continent’s greatest artists on display. Think Picasso, Kandinsky, Miró, Le Corbusier, Chagall… Some fun installations including a revolving nose and sardine-tin bed, and some whacky videos. Read our dedicated post about the exhibition at the Pompidou Centre. Also on is the new temporary exhibition, Mon Oeil. The main children’s character from the Centre Pompidou in Paris website is the thread through 5 interactive spaces created by 5 artists. Visitors discover how to see things with their own oeil as they walk through the spaces. Very hands-on so great for kids and of course, creative adults! Monday, Wednesday, Thursday and Friday 5 to 7.30pm, weekends 12.30 to 2pm and 5 to 8pm. Free entry. Until 16 June. Top tip – Pompidou Centre, Picasso Museum and Jorge Rando Museum are the only art museums open on Mondays. This funky cultural centre has 2 new exhibitions, both photographic in February. 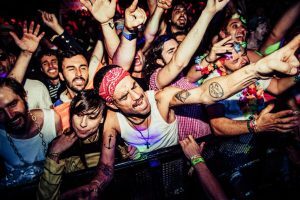 An impulse in a second – 18 photos of music festivals and concerts taken by local photographer José Báez, something of an expert when it comes to capturing the moment. 31 January to 17 March. Days of Brilliant Satin – the first individual exhibition by British photographer and model, Nadia Lee Cohen. Expect lots of colour and food for thought. 22 February to 12 May. Get to La Térmica Cultural Centre on the No 7 bus from Plaza de la Marina. Charity race in aid of Sudan. Choose to run 5km or 10km on Sunday 17 February. Race starts at 9.30am from the Athletics Stadium. Sign up for €10 or €12 depending on the distance you choose (plus €0.70 admin charge) here. Children can also take part with options to run 400m, 800m or 1,200m from 11am onwards. More information here. The third edition of the very colourful run arrives in Malaga on Sunday 17 February. The multi-coloured action starts at 11am at Malaga University Campus car park (Google Map link here https://goo.gl/maps/nRvLce75m5A2) at 11am and continues until 6pm. Ticket prices start at €16 – groups get a reduction. Sign up here. One of the most popular monthly events in Malaga starts 2019 with stalls selling vintage items, food trucks and cultural events at La Térmica. British Council films being shown include 8 shorts from the BFI Flare LGBT Film Festival in London from 8.30pm. Friday 2 February from 7pm until midnight. Get to La Térmica on the No 7 bus from Plaza de la Marina. El Zoco market on Muelle Uno sells arts and crafts every Sunday from 11am to 6pm. Combine your browsing with a stroll in the sunshine under the Pergola and a visit to Artsenal, a great art centre on the corner of Muelle Uno. Fresh produce grown organically in the Guadalhorce Valley to the north of Malaga. As well as fruit and veg, local producers sell bread and cakes, honey, olive oil, dried fruit and nuts, and organic soaps and creams. La Malagueta (between Paseo de Reding and Calle Cervantes) on Saturday 9 January from 10am to 2pm. Huelin Park Saturday 23 February 9am to 2pm. Malaga half-marathon – in its 28th edition, this is fun annual event. Not exactly a scenic route but you do see some interesting corners of Malaga as you run the 21k. Sunday 18 March – sign up still possible here. See you there! Keep your finger on the Malaga buzzer – sign up for our free fortnightly newsletter. All you need to know about what’s on and what’s new in the city in your inbox every other Friday.